Golden Slipper winning sire Pierro had another great day at the office on Saturday with a two state stakes double featuring Bellevue Hill (2c Pierro x Bellevue Girl, by Exceed and Excel) in Sydney and Regal Power (3g Pierro x Broadway Belle, by Redoute’s Choice) in Perth. In the opening race at Rosehill Gardens where the track was downgraded to a Heavy 10, Coolmore's Pierro (Lonhro-Miss Right Note, by Daylami) added Group race success when 2YO colt Bellevue Hill scored a dominant on-pace 2-length victory for trainers Gai Waterhouse & Adrian Bott in the $160,000 Gr3 The Schweppervescence (1400m) for 2YOs, defeating fellow colts Strasbourg & Fortress Command. Bouncing to the front as was expected, Bellevue Hill controlled the tempo and never looked in danger of losing at any stage. Following the race he was immediately promoted to the second line of betting for the Gr1 Sires Produce Stakes behind Castelvecchio, with co-trainer Bott confirming he’ll be backing up. 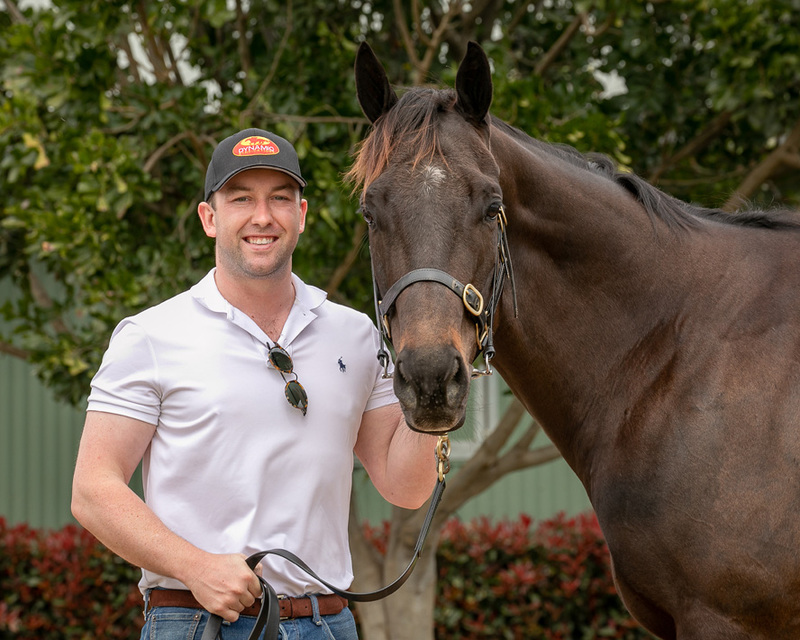 Bellevue Hill was a $400,000 yearling consigned by Aquis Farm at the 2018 Inglis Easter Sale. He improved his record to 2 wins and a placing (including runner-up in the Gr2 Todman Stakes) from 3 starts for $157,200 in earnings. Missing the Golden Slipper may prove a blessing in disguise for progressive Pierro colt because Bellevue Hill made light of the heavy conditions at Rosehill. Only an emergency for the Slipper, the Gai Waterhouse and Adrian Bott trained colt came into this 1400 metre assignment off a close second to Yes Yes Yes in the Group 2 ATC Todman Stakes and appreciated the step up in distance to lead all the way and win by a dominant two lengths. Adrian Bott confirmed Bellevue Hill would back up in the Group I ATC Sires' Produce Stakes (1400m) on the opening day of The Championships at Randwick next Saturday provided he came through this race without a hiccup. "That was the plan coming into today. We wanted to see a strong performance like that just to top him off for the Sires' Produce," Bott said. "He's a fit horse and now we've seen today he's versatile in all conditions so that might come in handy come next Saturday. "We thought if he'd got a run in the Golden Slipper he would have given it a real shake because he's the right colt, he's going to be top class for us going forward." 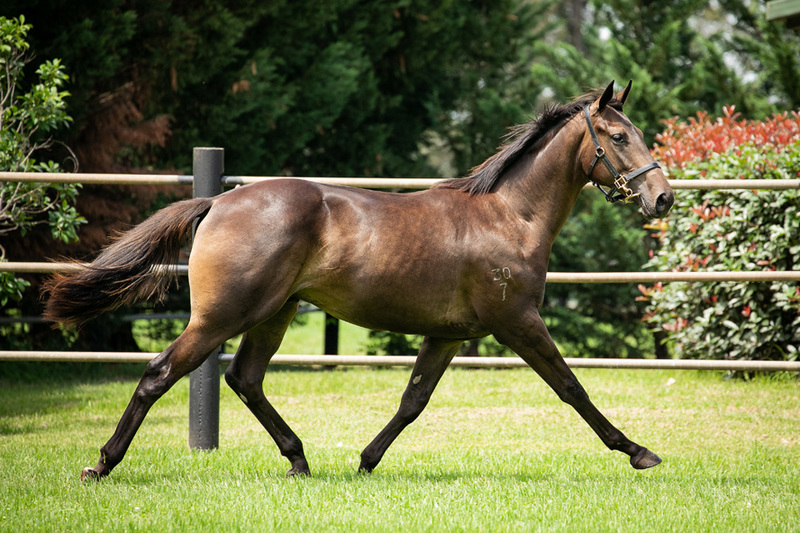 Bred by Aquis Farm, Bellevue Hill has now won two of three starts earning nearly $160,000 and is the second winner from Exceed and Excel mare Bellevue Girl, a full sister to Group III winning 2YO Sugar Babe from multiple Group II winner On Type. Bellevue Hill is the 16th stakes-winner for Golden Slipper winner Pierro, who covered an impressive 228 mares at Coolmore last spring at a fee of $88,000. At Ascot in Perth, Coolmore's Champion 2YO and Champion Stallion Pierro added stakes success when 3YO gelding Regal Power blitzed his rivals by 2.3-lengths for trainers Grant & Alana Williams in the $100,000 Melvista Stakes (2200m) for 3YO C&G, defeating fellow geldings Cockney Crew & Platoon. With a strong pace giving him a cart in, jockey William Pike swung wide on Regal Power and the odds-on pop responded like he’d been slung out of a sling-shot, whipping past his opposition for the easiest of wins. Racing in a rich vein of form, Regal Power improved his record to 3 wins (including the Listed Lex Piper Stakes) and 5 placings (including the Listed JC Roberts Stakes, Listed Challenge Stakes, Listed Rangeview Stud Classic & Listed Sir Ernest Lee-Steere Stakes) from 12 starts for $216,970 in earnings. Regal Power a three year-old gelding and a homebred for Bob and Sandra Peters has always promised to enjoy a staying trip and he powered clear to win. Regal Power is the third winner from stakes-winning Redoute’s Choice mare Broadway Belle and is a full brother to Group 2 WATC Derby winner Action. He is also a brother-in-blood to the Peter’s homebreds Arcadia Queen, winner of the Group 1 WATC Kingston Town Classic and Arcadia Prince, winner of the Group 3 WATC Scahill Stakes. Pierro is doing a sensational job at Stud. With his oldest just 4yo’s he is the sire of 230 Runners for 132 Winners including 16 Individual Stakes Winners (3 Gr1 winners) and 10 stakes-placed. 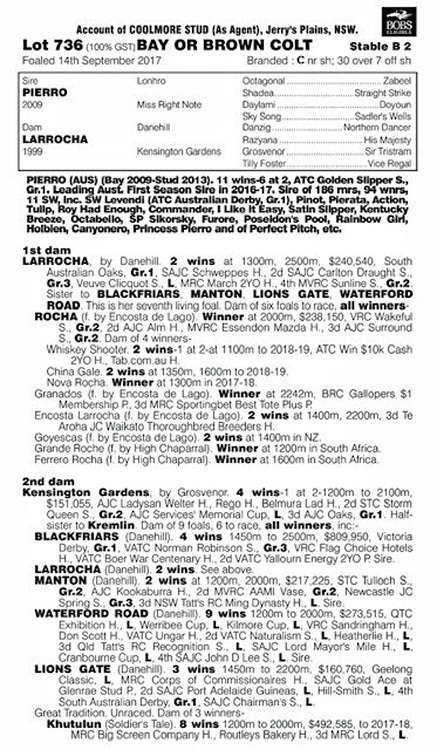 Dynamic Syndications at the Magic Millions Sales in January, purchased Lot 736 a terrific PIERRO Colt from the Gr1 Winning DANEHILL mare LARROCHA. She won the South Australian Oaks over 2500m. LARROCHA has had 6 foals to Race = 6 Winners including Gr2 Wakeful Stakes (2000m) winner ROCHA. LARROCHA is a daughter of Gr1 Placed KENSINGTON GARDENS who produced 6 to race = 6 winners (5 are Stakes Winners) in addition to Gr1 Winners LARROCHA is Gr1 Winner BLACKFRIARS, Gr2 Winner MANTON, three time LR Winner WATERFORD ROAD, Stakes Winner LIONS GATE and the unraced mare Great Tradition – Dam of Stakes Placed KHUTULUN. The PIERRO x DANEHILL Cross is the most potent cross for Pierro and his own Sire LONHRO. Purchased with the 3yo Classics and middle distance races as his targets as a 3yo and 4yo he will be trained by GAI WATERHOUSE and ADRIAN BOTT and will become available later in the year. However if you want to know more or reserve a share Give ADAM WATT a call at Dynamic Syndications on 02 9540 1511 or 0409 464 378 and have a chat. PIERATA (14c, Flying Spur, Zabeel). 6 wins-1 at 2-to 1400m to 2018-19, A$2,758,050, ATC Missile S., Gr.2, Sydney S., Gr.3, BRC Vo Rogue P., Gr.3, GCTC Magic Millions Guineas, RL, ATC Light Horse Brigade 2YO P., BRC Insulation Winning Rupert P., 2d ATC Randwick Guineas, Gr.1, Hobartville S., Gr.2, Bill Ritchie H., Gr.3, BRC Gold Edition P., L, 3d VRC Sprint Classic, Gr.1, BRC Sires' Produce S., Gr.2. 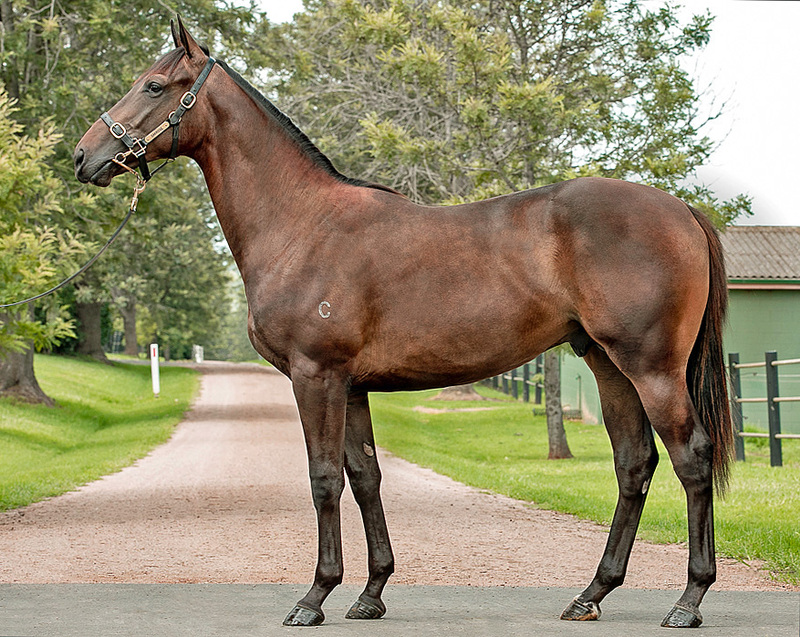 BELLEVUE HILL (16c, Bellevue Girl by Exceed and Excel). 2 wins at 2, 1100m to 1400m to 2018-19, A$158,200 ATC Schweppervescence H., Gr.3, 2d ATC Todman S., Gr.2. FURORE (14g, Redoute's Choice, Nureyev). 5 wins from 1250m to 2100m to 2018-19, A$155,930, HK$7,674,250, HKJC Hong Kong Classic Mile, L, 3d ATC Rosehill Guineas, Gr.1, HKJC Lung Kong H., 4th Hong Kong Classic Cup, L.
REGAL POWER (15g, Redoute's Choice, Metal Storm). 3 wins at 1300m to 22oom in 2018-19, A$216,970, Perth Racing Lex Piper S., L, WATC, Melvista S., L, WATC Furphy P., 2d Perth Racing Challenge S., L, 3d Perth Racing Sir Ernest Lee-Steere, L, Bunbury TC Rangeview Stud Classic, L.